This keychain features an iconic Buffalo Nickel. 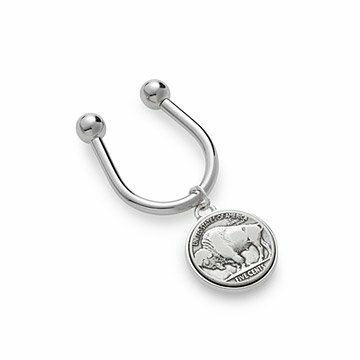 Carry a piece of iconic Americana with this Buffalo Nickel keychain. Designed by James E. Fraser and minted from 1913-38, the iconic coin honors Native Americans with its composite portrait based on Iron Tail, Two Moons, and Chief John Tree. The flipside gives the nickel its name with a profile of an American bison. The nickels are set in silver-plated brass and suspended from a silver-plated horseshoe key ring featuring a screw-off ball that lets you easily add or remove keys. Each key ring comes gift-boxed with a certificate of authenticity. Made in Mexico. Periodic polishing with a silver cloth.